Last week, I mentioned that we’re making valentines at our house. Stitchery, or needlework, has a particular “look,” where lines appear textural. Similar to sewing cards of toddlerhood, stitched cards have a charming look. Whether it’s Valentine’s Day or not. How to do it. Cut your card to size. Optional: Use a pencil to draw your design on your card. The pencil lines will be covered once your stitches are in place. Using your needle (or paper piercer or hole puncher), make evenly-spaced holes along the lines of your drawing. This is the path your needle will take with the floss. I suggest you pierce all the lines of one color at a time. Piercing more than one color can lead to confusion. To prevent your work from bending, you can do this against a self-healing mat, a phone book, etc. Or you can pierce against the air, which is what my child did. Sew along the pierced line. Pierce and sew all colors, one color at a time. I’ve taped the end of the floss and knotted the end. Which is better? Tape will give you a flatter finished product. When you’re finished stitching, you can either adhere it to a base, like blank card, or leave it — the back of your work is probably good-looking. Notes. My daughter announced before she began that backstitching would work best for her. You have many choices. Cross, chain, running stitches and French knots are all good, too. Take a look here for different stitches. Linking this blog post to C.R.A.F.T. 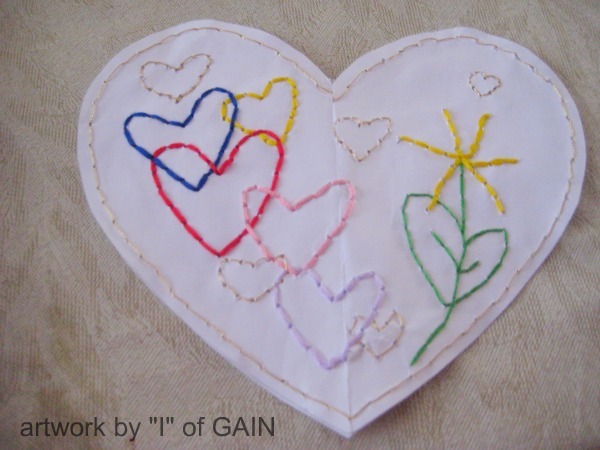 This entry was posted in crafting and tagged crafty monday, needlework. Bookmark the permalink. This is so cute! I love how very homemade and special it is!